I know that most parents know their children well. But do think back to when you were a teenager and wanted to hide something from your parents? A solid object or something you learned about that may have seemed cool but you knew your parents might not like. Well, in today's online world there's even MORE for teens to learn about and possibly want to hide. Published by the Drug Enforcement Administration on their Get Smart About Drugs website, the list features some warnings great ideas about everyday objects where kids can stash their drugs—inside alarm clocks, heating vents, teddy bears, game consoles, and (for the nerds out there) graphing calculators. More items mentioned: highlighter caps, shoes, and candy wrappers. Resources for parents with concerns over addictions. But somehow that principal - Andrea Drake - will then be working at JSCEE on "eliminating opportunities gaps." I guess so but if she doesn't play well with others in a school, how moving her to JSCEE will change that is a mystery. I didn't go to the Work Session on Wednesday but here's the agenda. Interesting reading and the budget detail for next year starts on page 59. For Central Office, it looks like Communications, HR (Nutrition and Securities) and Facilities took most of the blow from cuts. "Initial" school calendar dates here; still needs Board approval. I see the Board webpage has undergone a bit of a design update. Unfortunately, they don't have a calendar update for director meetings - not so helpful. Here's a link that has them as Patu, Pinkham and Peters (the three "Ps" of the Board) all have community meetings tomorrow. At least via one of their editorial writers, Brier Dudley. "PDF" is a new phrase out there - playtime, downtime and family time - that references the non-structured hours of a student's day. A couple of Fridays ago, we went to my daughter Isabella's school auction. I didn't really want to go. Young people who are detained by law enforcement in King County can no longer waive their right to an attorney on their own. On Monday, the King County Council unanimously approved a motion meant to ensure that young people in custody are fully informed when deciding whether to talk to law enforcement. The new ordinance requires kids detained at the Juvenile Detention Center in Seattle to get advice from an attorney first. Police are handling routine discipline issues in many Washington schools – sometimes even arresting children — finds a new study from the American Civil Liberties Union of Washington. The ACLU-WA found that 84 percent of the state’s largest school districts have police officers patrolling the halls, even at the elementary level in more than a quarter of districts studied. The ACLU-WA also found that police are more likely to be stationed in schools with more students of color and in low-income neighborhoods. That's relevant because researchers found that students were more likely to be arrested for regular discipline issues if police were based at their school. That last statement gives me pause because, in the course of attacking a teacher or other student physically, the attacking student could be charged with assault AND "disrupting the class." Maybe that law needs to be clarified. The ACLU is urging revisiting this law. Circling back to the subject of resilience, a very compelling conversation with actress Sally Field and ballerina Misty Copeland in the New York Times. Funny story from the New York Times on "the coolest kindergarten class in the world." Since 2010, the Pestalozzi Foundation has operated from inside the stadium — literally inside, not next door or across the street — offering families perks that are most likely unique in the world of early childhood education. The kindergarten borrows the stadium’s field, tunnels and roof for group activities. Players from the team come by to read to the children. Teachers use the arena’s main stand as a sort of giant break room. And on match days, parents clamor to reserve a spot to watch from the prime vantage point of the kindergarten’s deck, within shouting distance of the rowdy southern stands. Dribbling, here, had two meanings. One of Seattle’s flagship high schools is under investigation for possible football recruiting violations tied to a youth from Texas, who says he was flown north to Garfield High with promises of athletic opportunity. Will Sanders, 19, spent last fall’s football season as a running back for the Bulldogs, where he was the third-leading rusher — even though poor grades would have made him ineligible to play the entire time. While here, he bounced between the residences of a track coach and team parents. Meanwhile, the team racked up its best season in years. Well, echoes of Hale because they,too, had their best basketball season ever with imported players. On Saturday, telephone and network access to two schools Olympic Hills Elementary and Hazel Wolf K-8 were disrupted. A car accident on I-5 knocked a telephone pole across the highway and in order to move the pole, telephone and network cables were cut. The city is giving $2.3M for us to move to 2 tiers from the Families and Ed Levy, and also giving $300,000 or so to fund crossing guards at 100+ locations around the city! It still needs to be officially adopted by the Levy Oversight Committee and council, but that's a formality. They are all for it! There is this new meme for discussions in public education circles about helping kids - especially those in crisis - find "grit." To me, this sounds much like a sports idea when a kid gets hurt; "throw some dirt on it and get back up." It'sa good thing to encourage kids to learn how to rise up against issues and outcomes, big and small. But we all remember what it feels like - as a child - to not know just how you were going to climb over, dig under or just plain outwait a problem. The mayoral race is picking up steam with the addition of activist Cary Moon to the major candidate group including Mayor Murray, former mayor Mike McGinn, activist Nikkita Oliver. As for the Mayor's legal problems, I'm sure we will all learn more as the court case goes on but his record is what voters should really look at. To that end, a guest column from parent/activist Carolyn Leith (SPS parent of two students). On November 2, 2015, one day before the general election, Mayor Ed Murray held a press conference on the steps of Olympic View Elementary to promote The Levy to Move Seattle. Students wore their orange safety patrol vests, parents applauded enthusiastically, and the Mayor promised that a YES vote would mean sidewalks, always promised by the City - but never delivered, would finally be built on 8th Ave. NE. It has become clear that the legislature will need to go into overtime in order to get our work done this year. While making decisions about the state’s two-year budget is complicated, I am disappointed that Senate Republicans haven’t even made a good faith effort to begin negotiating so we could adjourn on time. I know you’re tired of hearing about unproductive partisanship. After just my first legislative session as your representative, I’m already pretty sick of bickering that holds back our important work too. Even House Republicans—admirably, in my opinion—want to sit down and negotiate. Nonetheless, I feel a need to let you know that Senate negotiators are literally not even sitting down at the table. I receive regular updates from our House budget negotiators, and they report that they’ve had conversations with Senate negotiators about Easter and the weather, but are met with silence when attempting to bring up the important work the legislature needs to do. This regular 105 day session will end with much unfinished business. No, the Legislature did not finish on time, and yes, the Governor has called a special session. Two sad remembrances - Mark Twain died on this day in 1910 and Prince died a year ago. Both brought great art to our country. It appears that the Legislature will not be getting their job done of creating a budget that includes fully funding public education. I'll assume the Supreme Court will sit back and just watch it unfold with the rest of us. I wish they would actually do something but now all we can do is wait. I don't think any amount of lobbying or advocating is going to make a whit of difference at this point. A letter of interest called "An Educational Funding Position Paper Submitted by the Superintendents of the NW Educational Service District 189 Region" was send to the Governor, State Superintendent Rykdal, and members of the Washington State Legislature on March 23, 2017. 2017-2018 Calendar to be at District Website "Soon"
Thus sayeth Superintendent Nyland at last night's Board meeting. I would assume "soon" to mean by the end of the week. He did say it would include holidays and breaks but probably not Early Release days. That list is mighty short, just seven people. You don't need to call in but just show up and ask that your name be added to the list. Now's a good time to get in there and tell the Board what is troubling you about the district. By request, a thread on this topic. Waitlist link. Diane Ravitch writes about Washington state, billionaires and the inability to fully-fund public education. 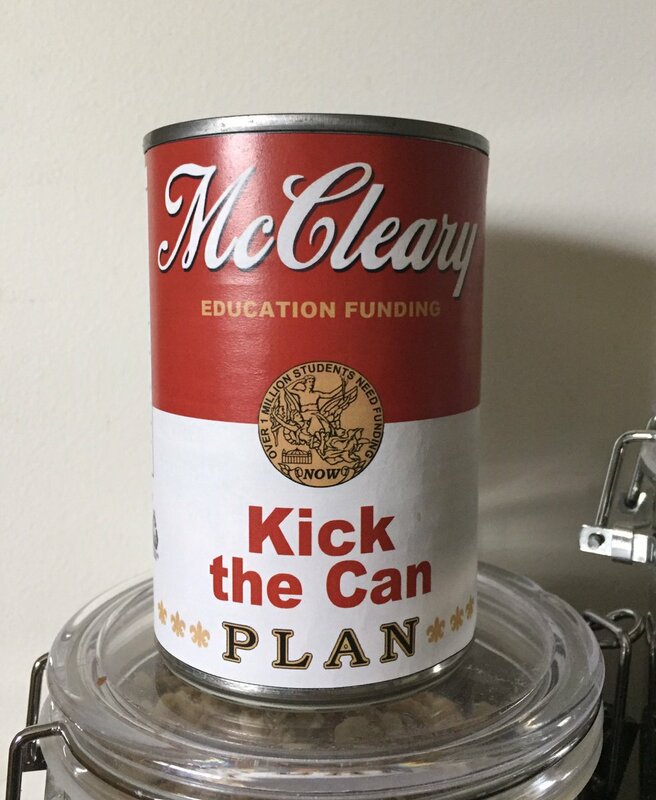 I previously posted the long memo called Real Choice vs. False Choice: The Repercussions of Privatization Programs for Students, Parents, and Public Schools that Senator Patty Murray sent to her colleagues in late March about the privatization of public schools. She does credit in laying out real world examples of how privatization has not worked in the U.S.
of choice for many students and families. on Privatization. There are a variety of topics covered about charter schools as well as tax credit and voucher programs. They give Washington State a "C" for school privatization. I haven't been writing this particular thread as of late but I found something rather interesting in the school board meeting agenda. This is the last week of the legislative session but I hope no one is holding their breath that the budget (and McCleary) will get done. It's just beyond the patience of districts, schools, staffs and parents to have to watch the Legislature have to use MORE state money to get work done that should have been finished years ago. It looks like this week and next week will be SBAC testing (at least for high schools). Again, your child only needs to take it once to graduate. You can opt your child out of the test in any other grade level and the district has to give them some place to be. Staff can recommend using the account for any reason. The current policy has clear reasons for using this fund which I believe is basically the district's rainy day fund. The current reasons are: emergencies for life, health or public safety issues and correcting accounting/budgeting errors. A plan to rebuild the fund (which staff says is not in the original policy but I see something that approximates that). If this change does not happen, then the district cannot access these funds in order to shore up the budget for next year. While I understand that need, I think striking stated reasons to access this fund is a bad idea. The large fund balance has been established as a sinking fund for the 2010 QSCB ($17.5M) that is coming due in June 2017. I'll ask but I'm hoping that doesn't mean the district has to pay out $17.5M in June for the QSCB (Qualified School Construction Bonds). To the Board meeting agenda. The bulk of the meeting - the Consent agenda, Action and Intro - is largely going to be Capital issues from several BEX IV projects. But what is of most interest will be the Superintendent's comments. One notation just says "West Seattle Elementary School" but there is nothing else to give an inkling what this might be. The other one seems far more serious. Interesting but somewhat concerning article from the Chicago Tribune about students who take the state's free SAT who then find that the score appears on their transcript (whether they want it there or a not). While the test is designed to evaluate whether a student is prepared for college, some parents say it's unfair to rely on just one exam. They note that anything from an illness to anxiety could disrupt the test-taking process, leaving students stuck with a score that could hurt their child's chances of getting into their dream school. Well, yeah. Some kids take the SAT multiple times. Some do better on the ACT. Why wouldn't the student and their parent decide what score goes to admissions offices? Seems like this could be an opt-in thing rather than a blanket item. Anyone heard of this for SPS? Teens Take a Stand: Learning about your rights - a program on Friday, April 21st at the Douglass Truth Library from 4-5:30 pm. Hypocrisy: WA legislature doubling down on unconstitutional funding of charter schools citing "the will of the voters" in 2016, while rescinding constitutional ST3 funding in 2017 that voters passed. We see you and your voting records. Don't you dare rescind the class-size reduction we all voted for. This is getting ridiculous. Yes, it's amazing when a majority vote is the "will of the people" when it suits the legislature's purposes but when it doesn't, sorry, your vote doesn't matter. We are still sorting through feedback from the Board as well as our continued stakeholder engagement to determine the next set of revisions to the policy draft. Update: there's a new movie out about a gifted child called...Gifted. Also, thank you to reader NE Parent for this link to a NY Times article on finding more gifted students of color. It makes for fascinating reading. Such sad news from San Bernadino yesterday. It is almost breathtaking that this teacher's husband signed in at the office and then proceeded to go to her classroom to confront her with a gun. In a room full of children. My heart goes out to the family of the child, Jonathan Martinez, who died along with the teacher, Karen Elaine Smith. Does Your Student Know about CTE? That would be Career and Technical Education, what we used to call vocational education. Seattle Schools has really kicked this department into gear. This follows a national reawakening (finally) that not every student is or wants to go to college. The New York Times had a revealing article today about sharing PTA fundraising dollars. According to a new report by the Center for American Progress, a liberal advocacy group, schools that serve just one-tenth of 1 percent of American students collect 10 percent of the estimated $425 million that PTAs raise nationwide each year. Please clearly print the following information and return to your school’s principal. I listened to Superintendent Nyland's explanation at last Wednesday's Board meeting of why class sizes may be larger at Option schools than neighborhood schools. Folks, it is supposed to be a nasty day weather-wise. The afternoon is to bring very strong winds and I urge you to not be out there unless you absolutely have to be. In recent years, we did have a father killed in a car traveling through a park during a high windstorm (luckily his child survived). No directors' community meetings on Saturday; I note from Wednesday's Board meeting that directors are struggling to find spaces. Congratulations to the 200 young artists whose tremendous talent shines through in the 2017 Naramore Seattle Public Schools (SPS) Middle and High School Art Show! Join us for the reception and awards ceremony on May 5, at 6:00 pm as we honor all participants for their amazing creativity! Free and open to the public. A huge congratulations to the Michael James, Director, and the Ballard High School Wind Ensemble which will play at Carnegie Hall in NYC. We were accepted into the "New York International Music Festival" through a competitive audition process and are one of eight ensembles chosen to perform at this particular festival on stage at Carnegie Hall on April 11, 2017 at 1:00 pm. SPS high schools won top honors at the Washington State University's Edward R. Murrow High School Journal Competition in photography (1st place, Ballard), best newspaper edition (1st place. Nathan Hale), feature writing (2nd place, Nathan Hale), best website (2nd place, Nathan Hale) and multimedia (2nd place Nathan Hale). More congratulations this time to the Thornton Creek Archery teams that recently competed at Central Washington University at the National Archery in the Schools Program. One Thornton team placed second out of 14 teams in the Elementary Division. Three girls on that team placed in the top ten of the elementary girls category to qualify for the National Tournament in Louisville, Kentucky, May 11-13th , 2017. The district is looking for members for an Ethnic Studies Task Force. This seems a bit cart before the horse given the Board has no approved this effort. I think the Board approves of the idea but no firm approval has been given. Of course, most SPS "taskforces" find their work usually shaped or ignored by senior management so this may just be for show. Focusing on grades 9-12 is the first step in ensuring ethnic studies are part of the preK-12 learning experience for all students in the district. Help inform and shape this important work by applying to join the task force by April 21. Trying to get your kid into UW? They just received a ranking of 9th out of 10 among world universities from the Center for Work University Rankings so it may get even more competitive. A very fine article from NPR from last September about race and charter schools provided a wide variety of thoughtful opinions. Much of the debate has been around the NAACP calling for a moratorium on the opening on new charter schools. Some education leaders are rushing to embrace the newly frank conversation about the racial impact of education reforms. Others are caught awkwardly in the middle. And some — especially conservative — reformers feel alienated. Update: it appears that the Legislature is doing even more. This from a story in the Puget Sound Business Journal. A bipartisan group of Washington state lawmakers on Wednesday introduced companion measures, House Bill 2200 and Senate Bill 5919, to update the state’s consumer protection act and require internet service providers operating in the state to obtain a customer’s permission before selling data. Internet service providers including Comcast, Verizon and AT&T released statements since Congress appealed the FCC rules, claiming they don’t intend to sell customers’ browsing histories. The Times had an op-ed today from State Rep. North Smith, R-Clinton, who serves as the ranking Republican member on the House Technology and Economic Development Committee about a bill - HB 1904 - that she is sponsoring. The protection of your personal data and privacy is crucila, which is why I want to make one thing very clear; while contressional Republicans may be making it easier to sell your data, lawmakers in Olympia have a strong recrod of accomplishment in protecting your personal information. House Bill 1904 has bipartisan support in the House, and is one of the few revenue bills that will be on the table during final budget negotiations this sessions. The bill hasn't even made it out of the House committee so I have to wonder. For this Work Session, all of the directors were present in person except for Director Blanford who was there via phone. The Superintendent was there as were several senior staff members. President Peters did seem to set a good tone for action when she stated, "We are going to have to make decisions tonight." I actually don't want to do a complete detailing of the work session but I'll just summarize and give some highlights. Also, some of the nitty-gritty of the details of what pots of reserves that are actually going to be used went over my head. I felt like I must have miss that discussion somewhere. If you are at one of the option schools listed below -- you will have LARGER class room sizes in 2017/2018. I went to the Work Session on the budget for next year. More to come but spoiler alert: the majority of the Board went along with everything staff wanted. One of the bright spots this year has been the bipartisan agreement on the capital budget, which funds a variety of building and maintenance projects throughout the state. I was very pleased to see a large number of projects that I advocated for funded in the proposal. In particular, the capital request for Seattle Public Schools that I led for our Seattle delegation was approved in its entirety! Over in Bellevue, their schools' foundation raised over $700,000 at their annual luncheon. Ardmore Elementary School Principal Chas Miller told guests that in his 11 years as a principal in other states, he’s never seen anything like the community support for education that is a cultural norm in Bellevue. “It’s not as if I came from a place that didn’t care about the schools, but the sheer coordination and the sheer will of so many people at the same time saying, ‘We’re going to support public education,’ was something I had never experienced in my career,” Miller said. For the district’s youngest learners, particularly in the Title I Ardmore student population, the benefits are striking. “In Kindergarten last year the number of students scoring ‘far below proficient’ dropped from 74% in September to 10% in June—a 64% change,” he said. The Times reports that $800,000 has been raised to cover testing costs for low-income students who are taking AP or IB tests this year. If you watched today's testimony, you saw numerous people, including business owners, who would pay the taxes in the House budget (capital gains and B&O) step up to say they supported it because our children come first. But one lobbyist for our state's biggest companies, including Walmart, Shell, Uber, AT&T, Blue Cross, and more, claims in this tweet that it was just a room full of "spenders" (as if you can reduce parents and children to that) and no "payers". Just a sign of what we're up against. But we can and will win this battle, because when it comes to ensuring every child has an amply funded public education, losing is not an option. I would remind Mr. Gano that every adult in that room pays taxes. Appalling. I'll be trying to have interviews with all the mayoral candidates but I did see this article from Capitol Hill Seattle with some of candidate Nikkita Oliver's education ideas. The cancelled Work Session on the 2017-2018 budget is scheduled for tomorrow, Monday, April 3rd from 5:30-7:00 pm at JSCEE. What has now become clear is that the education plan introduced by Senate Republicans doesn’t put as much new money into schools as GOP leaders would like people to believe. Senate leaders have said their budget would put about $1.8 billion in new state money into K-12 schools in the next two years — a number that, on its surface, comes close to matching the $1.9 billion investment promised in a competing plan from House Democrats. But that Senate estimate of $1.8 billion doesn’t reflect the actual amount of new funding that would go to school districts under the GOP proposal. Senate leaders now acknowledge that — after factoring in how their plan would reduce local dollars for schools — their approach would add significantly less than $1.8 billion to the state’s K-12 system in the next two years. Two policy wonks, Barbara Billinghurst and Nancy Chamberlain, at the Washington's Paramount Duty Facebook page have really done yeoman's work on this issue. Thank you! Underenrolled Schools Taking It On the Chin: Why? News about underenrolled schools in several regions of the district (plus one update at the end of the thread on high schools). The first story - very widely publicized- came from an incident last weekend where girls traveling with an adult who works for United airlines got stopped from boarding the plane because of the leggings that they were wearing. There was a high-profile mom activist in line who saw this and started a Twitter frenzy that included a couple of actresses who stepped in. United answered back but left out a key point (which hurt them). The point was that for flyers using United's "buddy" rates, the airline requires a higher standard of dress (for men and women, boys and girls). It was not that that what the girls were wearing was objectionable but that it was not up to the code. The airline didn't explain how they created their code and frankly, I don't think they have to. They make their employees wearing uniforms and I would think that getting a big discount for your family might be worth dressing up more than you normally would to fly. One key issue here is this debate over whether leggings are pants or not. To me, they are not. I noticed at Facebook that many adult women say yes, they are pants and worn with a long tunic and boots are an acceptable outfit in public. I would agree but the majority of women and girls who wear leggings are not wearing long tunics. The nature of leggings is that they are very clingy. I think some of that is because in some activities, like yoga and ballet, the line of the leg is important to see. That's fine for those activities. And yes, they are super comfy but then again, so are pj's. The other story was about a high school that created a "do and don't" list for prom dresses. To make matters worse, it came out just a week before the prom when many girls had already purchased dresses. It was pretty patronizing BUT I do see the point somewhat.